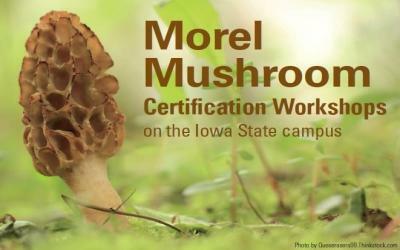 Iowa State University Extension and Outreach offer three hours classed for anyone interested in being certified to sell morel mushrooms legally within the state of Iowa. The workshop is held every year during spring on the Iowa State campus. To legally sell morel mushrooms in Iowa, sellers must complete a certification workshop that covers identifying morels and false morels. People can be poisoned by eating mushrooms that are misidentified as morels. By the end of the workshops, participants will recognize true morels from false morels. Iowans who have not certified in the last three years must re-certify this year. Registration is open to out-of-state individuals, but keep in mind local certification may be available in your home state. Two workshops will be held on the Iowa State campus in room 1302 Advanced Teaching and research Building (ATRB- located at 2213 Pammel Dr, Ames, Iowa) from 2-5 p.m. The training will be on Saturday, March 30 and April 6, 2019. Choose one of the two training dates, and please arrive by 1:45pm for checking as class starts promptly at 2:00 p.m.
Make sure to save your seat, register online at http://bit.ly/MorelWorkshop19. Once on the page click on new user sign up. Registration cost is $50 per person. If you are experiencing difficulty with the online registration process, please contact Registration Services at registrations@iastate.edu for assistance. Registration deadline is March 26, 2019. Pre-registration is important so that adequate materials can be arranged.